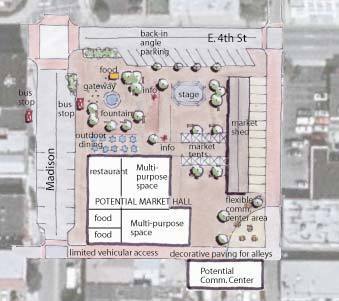 The City of Covington and its downtown organization, Renaissance Covington, has a vision to create a new civic square with a public market in the center of its revitalizing downtown. 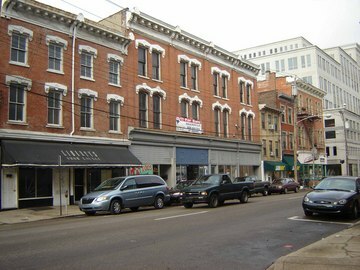 Central to the vision is the notion that the proposed square would preserve existing historic structures; be a venue for a variety of activities and uses, including socializing, eating and drinking, civic and cultural events, and shopping; and include both an indoor and outdoor public market. In the spring of 2006, PPS conducted a public visioning and planning process for a downtown public market. This led to additional visioning and planning with project stakeholders in the fall of 2006 focused on creating a civic square. The proposed site for the square boasts a convenient location, easy access by car, foot, and transit, nearby retail, employment centers and other destinations. 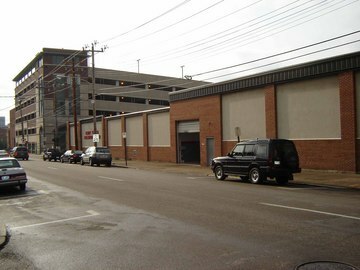 However, challenges include fast and heavy traffic along E. 4th and 5th Streets; one-way traffic along Scott Boulevard; overall poor pedestrian experience on surrounding streets; a dearth of transit options; and a poor perception of safety. Drawing from the city’s diverse population, a wide array of events, recreation, and food-related activities were envisioned for the square, creating, in essence, a “living room” for the city. The major features envisioned would give the square its identity, attract people and support the desired activities, which included decorative and interactive fountains, public seating and a well-planted and overall “green” environment, among other amenities. To support these uses, PPS’ recommendations called for the creation of two squares linked by a central plaza with a fountain. A park-like green on the southeast quadrant of the block would be used for daily activities and special events, while a market square would be located on the northwest quadrant.